One of the most interesting bits of architecture in the vast outdoor (and underwater!) museum that is Baia is the so-called Temple of Venus (photo, right) . It is directly adjacent on the west to the entrance to the small lovely port of modern Baia. 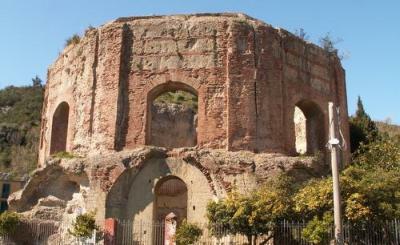 The structure was built in the reign of Hadrian (117-137 AD). It offers striking evidence of the evolution that took place in Roman architecture during the Julio-Caludian period. There is a clear difference between this building, characterized by a high tambour (the circular vertical part of the cupola) with a circular internal plan and external octagonal one with large windows, and the elementary structure of other, earlier buildings in the area. The use of opus cementicium as the main binding ingredient had reached perfection; this is a mixture of stone chips and strong mortar that contained pozzolana (a volcanic ash named for the town of Pozzuoli). This newer technology as well as an increasingly specialized workforce led to the construction of buildings where space was conceived of in a different and very modern way; mixtilinear (combing both straight and curved lines) forms of architecture started to become more widespread and were marked by bright spaces designed to be aesthetic and pleasing to the eye and not merely lived in. This Temple of Venus is “so-called” because it was really something else (as is the case with a number of other “temples” in the area—the Temple of Serapis in Pozzuoli, for example). In this case excavation has shown the structure to have been a thermal bath, the baths of which reach down to about six meters below today’s visible ground level. The outer face is in brick, with large porticos of reticulatum; inside, the walls were dressed with slabs of marble up to the impost of the windows and higher up with mosaic. The outside still shows traces of the original stone facing. The dome was formed by an umbrella vault; a part of the octagonal roof remains visible from the outside. The lower part of the building, on which other only partially visible buildings lean, has become difficult to interpret; this is due not just to the lowering of the ground level caused by seismic activity, but also due to the restoration designed to reinforce the structure at the beginning of the 20th century. The thermal baths were connected to a structure in the rear and stretched along the slope of the hill.